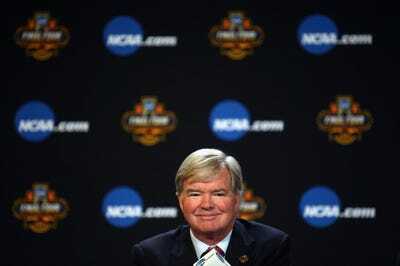 Mark Emmert commented on the need for athletes to be in college if their only purpose is to reach the pros. LaVar Ball recently pulled LiAngelo Ball from UCLA after he was suspended indefinitely. LaVar Ball said at the time that “one of the main reasons [LiAngelo Ball] went to UCLA” was to play basketball. NCAA president Mark Emmert is under fire for comments made during a conference about whether or not LiAngelo Ball should have been at UCLA at all before his father pulled him from the school. Emmert was a guest at the 2017 Learfield Intercollegiate Athletics Forum when LaVar Ball was brought up. Ball recently announced that he pulled LiAngelo Ball out of UCLA following his indefinite suspension from the basketball program. According to Ball, the move was made because the NCAA was being slow to rule on LiAngelo Ball’s eligibility and “one of the main reasons he went to UCLA” was to play basketball. Emmert said LiAngelo Ball should not have been at UCLA if he was only there to prepare for a career as a pro basketball player. Many were quick to criticise the NCAA president, noting that the main purpose of universities is to prepare students for professional careers.